As a follow-up to the first item posted here, the Bitcoin that we accumulated for free when it was valued at $3k per coin, and that we sold near its subsequent high around $20k, served us well. 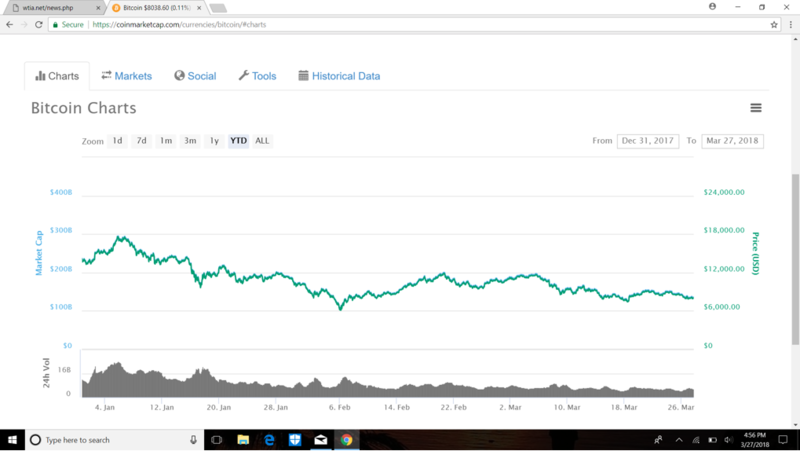 Since then however, we have re-entered into fresh accumulation, starting at around $6k, with current value as of this writing at about $8k per coin. As things stand currently, from my perspective, with transfer fees significantly lower than when Bitcoin was perhaps a bit overblown, and with seeming stabilization at somewhere around $6k as current support, as indicated on the chart below, and resistance or perhaps more to the point, seeming stability around $8k, Bitcoin appears to have returned to its utility and purpose as an exchange of value, rather than simply a store of value or a “commodity” to be traded like cattle.